Eyebrook Reservoir has for many years supported the English Disabled Fly Fishers Association. During 2018 Eyebrook host the Disabled International Competition with teams from England, Wales, Scotland & Ireland competing. 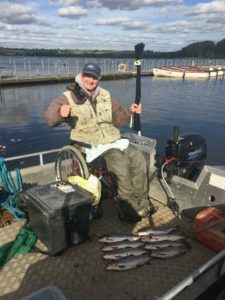 Eyebrook has two Wheely boats allowing easy access for disabled anglers who fish from a wheelchair or due to their disability have restricted mobility. Do you qualify to fish for the English Disabled Fly Fishing Team? Members can qualify for the English disabled team if they have a long term illness, with an accompanying letter from their Doctor, or have a physical or visual impairment. Members will also qualify if their in receipt of the old DLA Mobilty Lower rate, or in receipt of PIP Mobility Standard rate. Membership is open to individuals, clubs or associations who are interested in furthering the aims of the EDFF, whether disabled or not. All members, whether full or associate, can fish any of the fishing days.